Sami Khedira has returned to the Juventus squad for their Serie A game at home to AC Milan on Saturday. Cristiano Ronaldo could be back in the Juventus line-up in time for their Champions League quarter-final with Ajax, coach Massimiliano Allegri revealed on Friday. Leonardo Bonucci is certain Juventus' shock 2-0 defeat to Genoa on Sunday is "just a hiccup" on their way to securing an eighth successive Serie A title. Massimiliano Allegri felt Juventus' dramatic midweek win over Atletico Madrid was to blame for their first Serie A defeat of the season on Sunday. 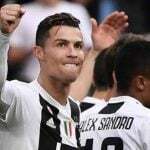 Juventus coach Massimiliano Allegri has revealed that Cristiano Ronaldo will play no part in a meeting with Genoa on Sunday as he is awarded a well-earned break. Claudio Ranieri has been confirmed as the new manager of Roma on a contract until the end of the season. AC Milan continued their impressive run of form as second half goals gave them a 3-0 win over Empoli in Serie A on Friday.